Mobile-based telematics—apps and hardware that measure driving behaviors—may be the future of safer roads. Increasingly, people are using these technologies to improve their own driving habits, while insurance companies use the data to offer rewards and discounts to safe drivers. One of the most prominent companies—and one of the first—in this market is Cambridge Mobile Telematics (CMT). 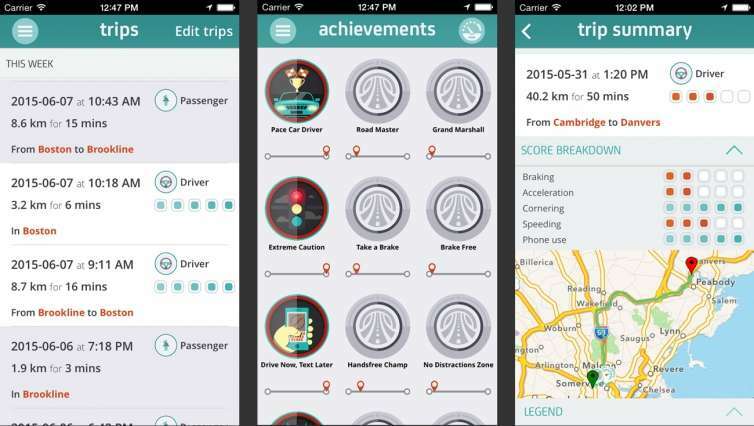 Co-founded in 2010 by MIT professors Hari Balakrishnan and Sam Madden, CMT develops incentive-based apps for safe driving that are being used worldwide, with aims of making drivers better and roads safer. DriveWell, CMT's flagship app, is based on years of MIT research and runs in the background on a smartphone, collecting data to detect road types, driving smoothness, speeding, phone distraction, and other factors. Drivers receive a score on a scale from 1 to 100, along with route maps and tips for improvement. Scores can be used for insurance discounts and prizes while competing with friends and other drivers worldwide. "Many people blame phones for causing accidents, but we are demonstrating the possibility of using smartphones to make driving safer," says Balakrishnan, MIT's Fujitsu Professor in Electrical Engineering and Computer Science. Over the years, CMT has collected promising data on the app's effectiveness, and on driver safety in general. The startup has users in eight countries and is now partnered with a number of major insurance companies and service providers, including Discovery Insure of South Africa, Desjardins Insurance of Canada, Hellas Direct of Greece, and Towers Watson. The startup has also developed an optional hardware component, called the DriveWell tag, which attaches to a car's windshield and augments smartphone data. The tag also provides real-time crash detection and roadside assistance. When the tag detects an accident, it transmits data to the phone, and then to CMT's servers. An operator from a call center then contacts with the driver to provide assistance. "This was a huge challenge for us, and one we relished because South Africa has one of the highest accident rates in the world," Balakrishnan says. At the start of the contest, 81 percent of drivers said they were safe drivers—but the initial data indicated that only about 33 percent actually were. Within two weeks, CMT and Discovery found that unsafe speeding among the riskiest participants dropped by 40 to 50 percent. Participants also cut down their hard braking, cornering, and phone usage incidents by half. "The app helped drivers improve; the data shows that drivers with low scores [below 50] improved by 40 percent in just two days. This shows that safe drivers are made, not born," Balakrishnan says. The app's effectiveness, Balakrishnan says, lies in incentives—not just insurance discounts, but also social games, feedback to drivers, leaderboards, badges, and friendly competitions for prizes. In this way, CMT hopes to pioneer positive behavioral incentives that recognize and reward an individual's safe driving behaviors. Many of the app's users, for instance, can already send regular updates on their driving scores to their insurance providers and receive adjusted quotes in real-time. CMT is a spinout of CarTel, a project initiated in 2005 by Madden, a professor of electrical engineering and computer science, and Balakrishnan. Then at MIT's Computer Science and Artificial Intelligence Laboratory (CSAIL), the researchers aimed to use mobile sensing and data analytics to improve road transportation. In 2011, through the MIT Industrial Liaison Program, the two professors connected with a large U.S. insurance company that ran extensive field tests of CMT's smartphone-based telematics technologies. At the time, insurance firms were piloting dongles in on-board diagnostic systems for Usage-Based Insurance (UBI) programs. "We thought we could match what the dongles were measuring solely through phones," Balakrishnan says. "But there were initial worries about generating inaccurate data and battery consumption." The app's accuracy and low battery consumption, Madden adds, are the result of key innovations in signal processing and machine learning, made at MIT and CMT. Innovations include accurately estimating the dynamics of a vehicle from smartphone sensors, determining whether a user is a driver or passenger (or in a car at all), and detecting crashes in real-time, among other things. With its technology now validated through papers, field tests, and international launches, CMT is focusing on rapid growth, Madden says: "The next stage of CMT is to bring our products and apps to millions of drivers." Send me a "registration token" and sign me up. Their website says they are not accepting new trials.